Is your doll’s dream house or action figure’s lair too expensive or too big? Your child may enjoy creating their own version with you. When the toy gets neglected (as these large toys inevitably do), you can just put it in the recycling bin as it didn’t cost you a penny anyway. A suitable cardboard box or boxes (if your child wants a ‘house’ which fits in their pocket then use a tiny box whereas some children may want to make a massive ‘lair’ from many boxes). Put the 'cross' into the box. Carefully remove the ‘front’ panel from a box. Use the removed cardboard to create a vertical panel and a horizontal panel which match the size of the top edge and the side edge of the box you have chosen to use. Put slits in the middle of the two panels you have created (these slits should run halfway into the width of the panel). Slide the panels together (using the slits) to make a cross. Put this in to the box to create four ‘rooms’ inside your new ‘dolls house.’ You may like to use tape to keep things in place. Optional - You and your child could add other features to the house, such as an opening front wall, ‘wall paper’ (wrapping paper) and 'glass windows' (clear tape). You could even use any extra card or tape to make furniture or stick-people if you don't already have toys that will fit. Add as much detail as you like. 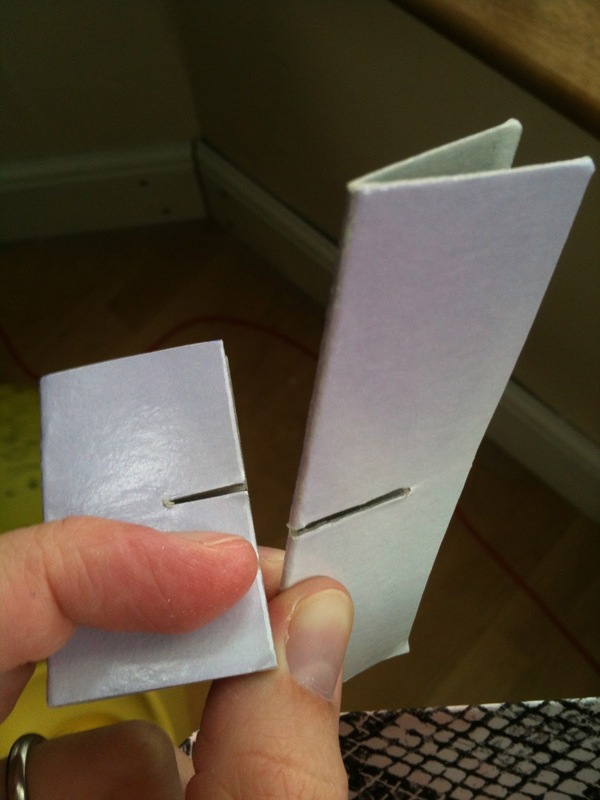 Note that the straight edges of paper or thin card can cause cuts so you may like to put a suitable tape along them. As with all toys and homemade things, children should be supervised when using them. Be aware that parts of the card, paper and glue or tape may break off and present a choking hazard. Do not use cardboard or paper which has previously packaged poisonous or hazardous substances. Take care when using scissors and keep them out of children’s reach. Always use safe glue and other non-toxic artistic materials.